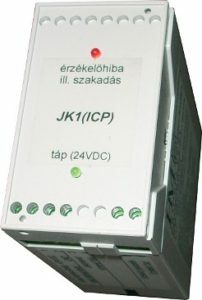 The JK(ICP) signal conditioners serve to provide sensor excitation power and prepare measurement signals of dynamic ICP® -sensors (acceleration, force, pressure and torque) for readout, recording or analysis purposes for data loggers, recorders and computer based data acquisition systems with traditional voltage input (requiring the use of a separate excitation source). (ICP is a registered trademark of PCB: piezoelectric sensor with integrated charge amplifier) The 1 or 3 channel units are mounted in a small box for click-on on standard DIN-rails. All kinds of ICP® -sensors can be connected to the JK(ICP) units. The units provides the sensor excitation power (constant current). The signal amplifier can be ordered as 1x, 10x or 100x (or as any number between 1 and 100) and the bandfilter frequency range (standard: 0,2 Hz ... 15 kHz) can also made with customized ranges. The channels in the 3-channel version can be different.